Like so many young (and not so young) people, we thought we needed to go somewhere to be a part of the movement—preferably somewhere hip, like one of the grittier parts of the Bay Area, Brooklyn, or Detroit. It took us a few months on the road before we realized that the most important thing we could do was to start a project back home in Omaha, Nebraska (Truck Farm Omaha). After speaking more with Malik and others, we began to understand that very few people would like it if someone just showed up one day and told them what to eat, or how to grow food. More importantly, we realized that every single community needed this work to be done, especially places like our hometown, where corn is king. As Eugene Cooke, a farmer in Atlanta, GA said, “Grow something … grow where you are!” This phrase has become our mantra and something we say whenever we’ve had the chance to screen Growing Cities. And many of the most intriguing projects we’ve encountered in the last several years have embodied this approach–from Sophia Buggs at Lady Buggs Farm in Youngstown, Ohio to student food system activists at Cornell College in Mt. Vernon, Iowa. 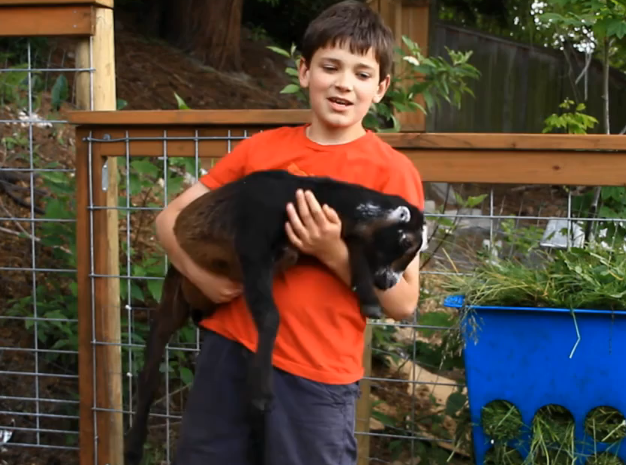 Whether it’s growing a tomato for the first time, or taking it a step further and lobbying to legalize backyard goats (like Jennie Grant of the Goat Justice League, who appears in the outtake below), everyone can do a little bit more to create healthier, more sustainable, and just communities. Growing Cities will be showing all over the U.S. this spring. Find a screening, add your project to our national urban farm map, or find out how to host a screening in your community. Thanks for the shout out! I included my facebook plug because the one in the article is not sending folk to my page. Thanks! Know your food know your farmer!